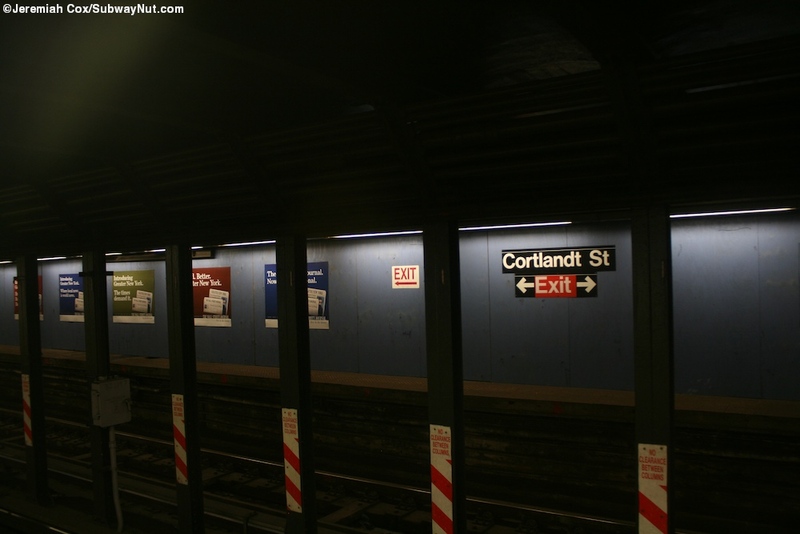 Since the September 11, 2001 attacks Cortlandt Street until 2011 spent more time closed than open. 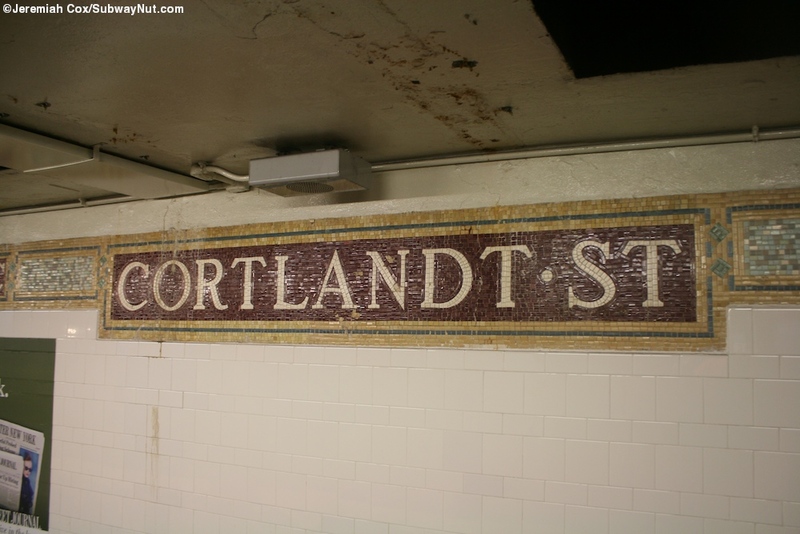 The stop was first extensively damaged in the attacks and although N/R service resumed through the station on October 28, 2001 it took until September 15, 2002 for the stop to reopen. 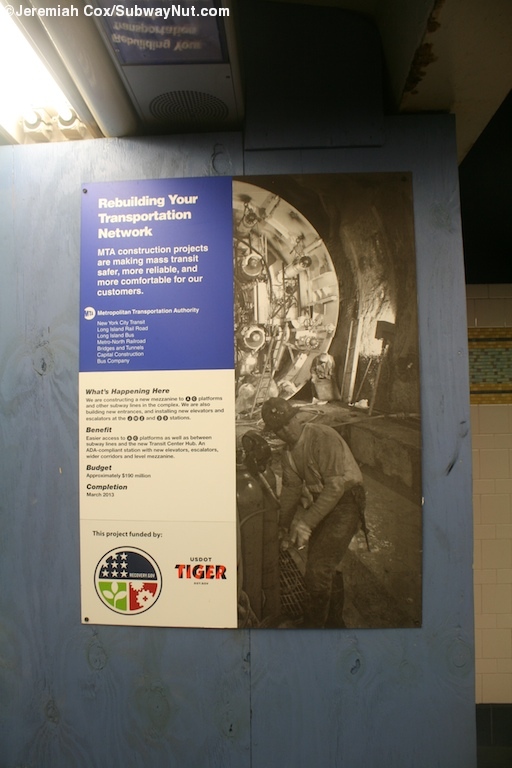 On August 20, 2005 the station was fully closed again because the Dey Street Passageway for the Fulton Street Transit Center had to be excavated. 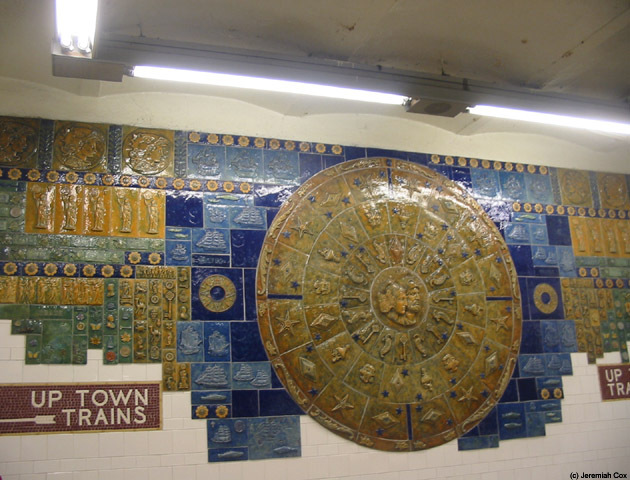 This project was supposed to last for only a few years but further construction at the World Trade Center Site Delayed the station. 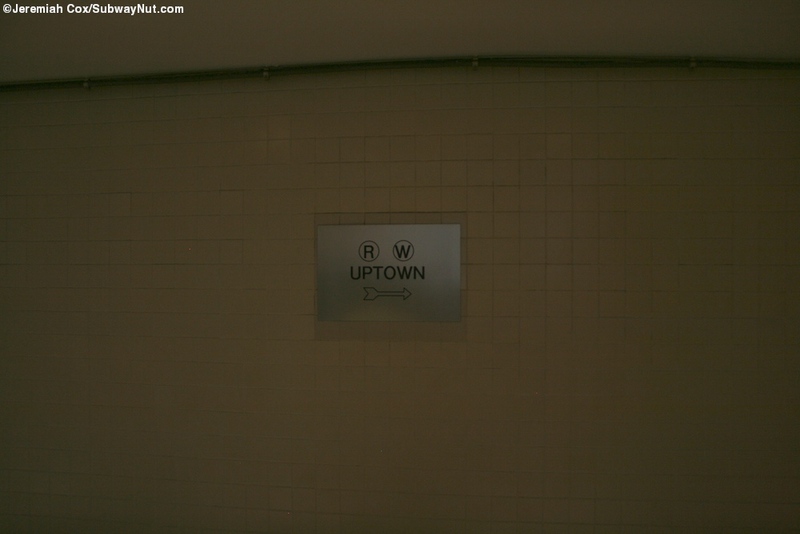 It took until November 25, 2009 for the uptown side to reopen but the downtown side remained closed since it is on the edge of the bathtub of the World Trade Center site slowly getting rebuilt. 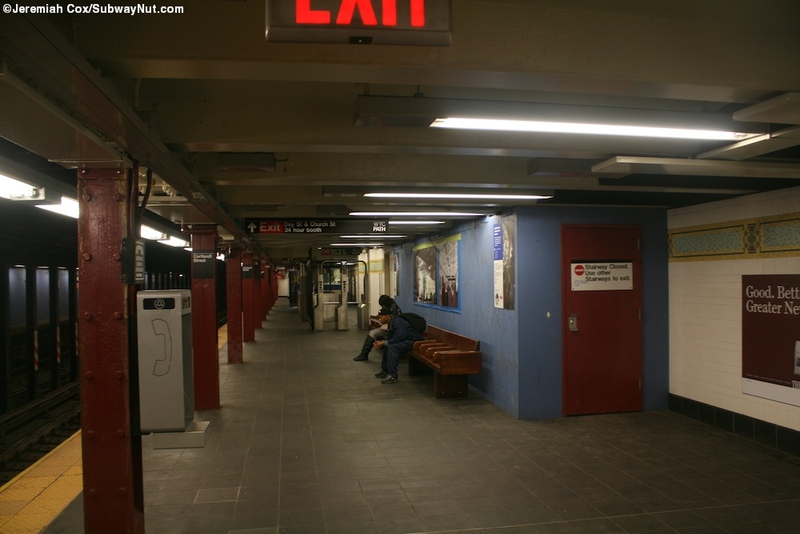 On September 6, 2011, after one train entered service at the station to pick up the dignitaries from a closed to the public ceremony in the Dey Street Underpass (including a ribbon cutting at the top of that staircase) at 4:03pm the first train arrived, an hour early, the signage said it would open at 5pm. 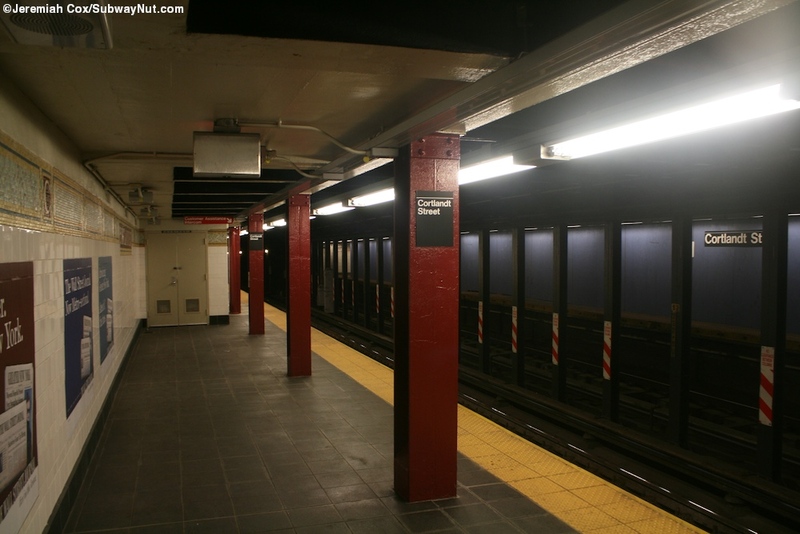 The station's present condition is two open side platforms for the two-track line located just beneath the surface. 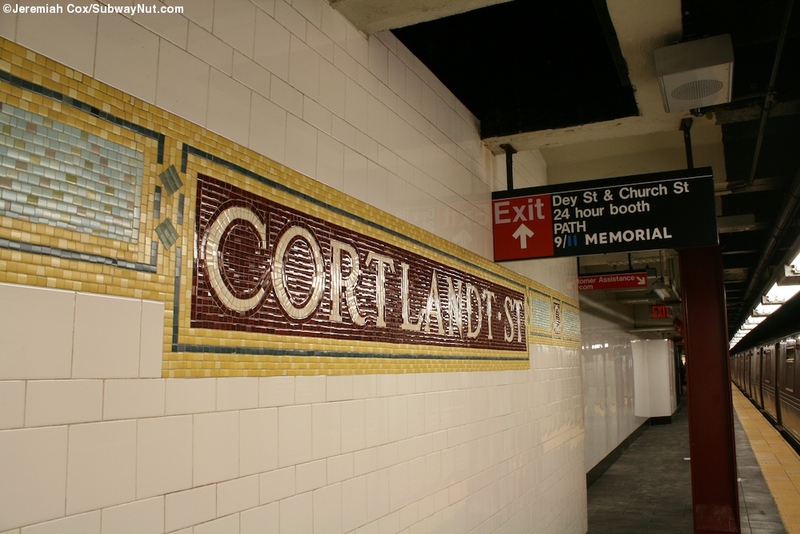 The station has its restored tiling consisting of Cortlandt St name tablets on a red background, located directly set into the trimline of gold with a dark blue secondary border and a lighter blue background. 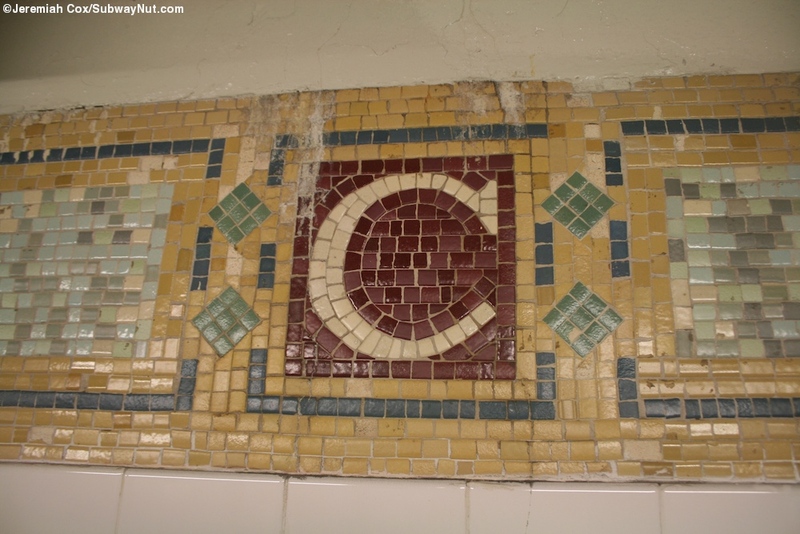 There is also little Cs in it at regular intervals. 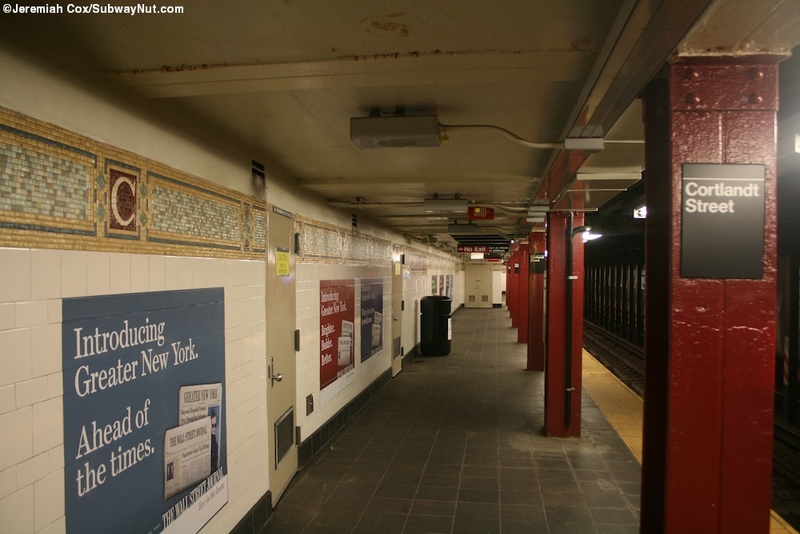 The northern end of the station will soon connect to the Fulton Street Transit Center and World Trade Center Transit Hub. 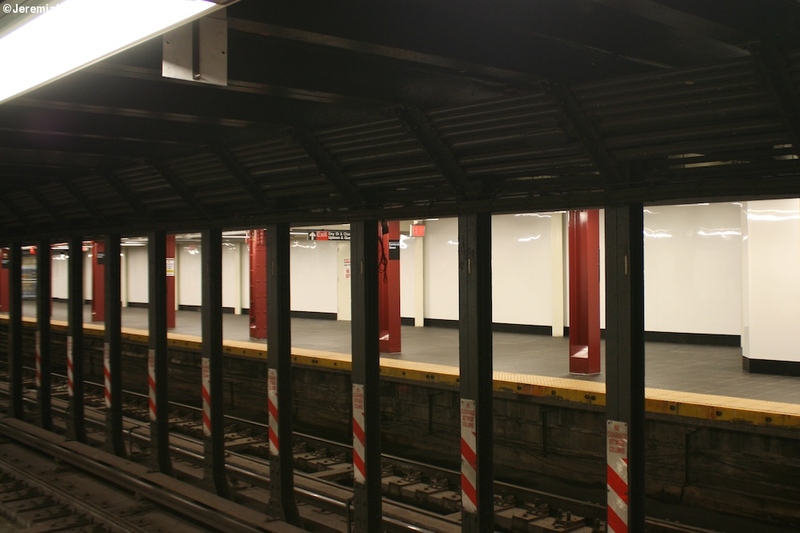 These portions of the walls are tastefull reflectively white that avoid the standard blue plywood the MTA usually uses for these construction areas. 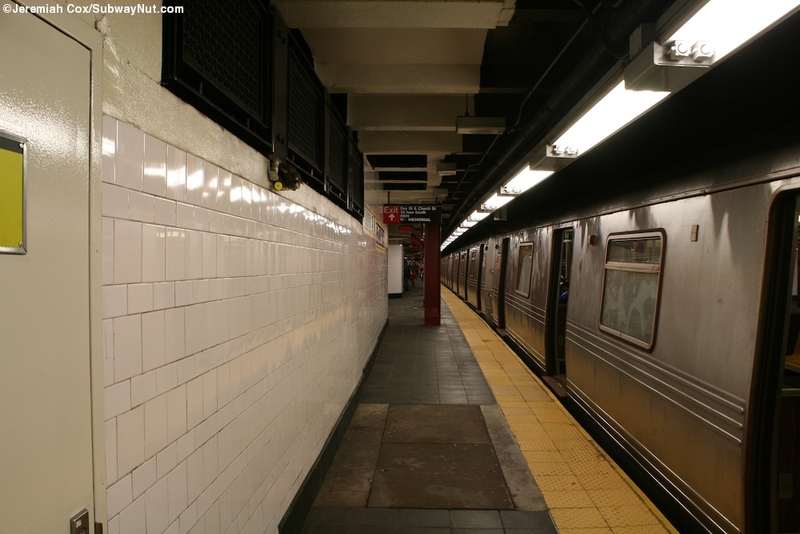 The just reopened downtown platform is right along the side of the bathtub, and its temporary wall has a door that if opened lets in the light of the construction site beyond. 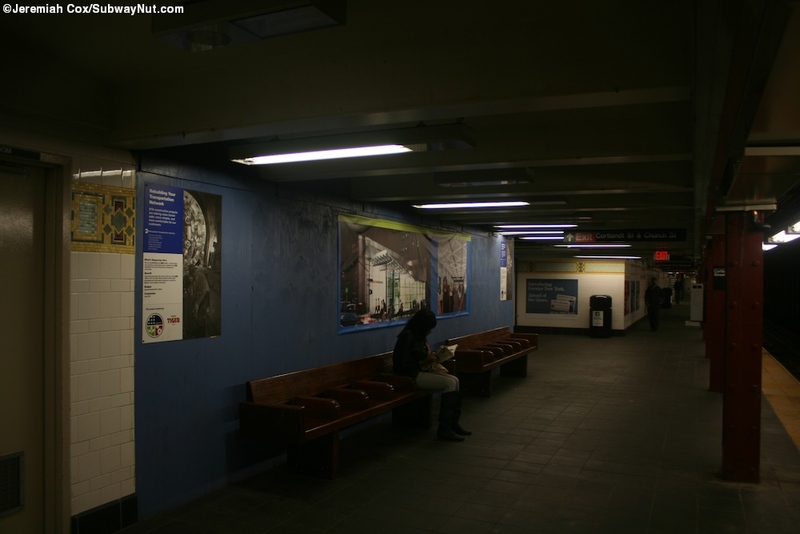 This area used to connect to the outdoors in its 3 post 9/11 open years and the temporary outdoor PATH station. 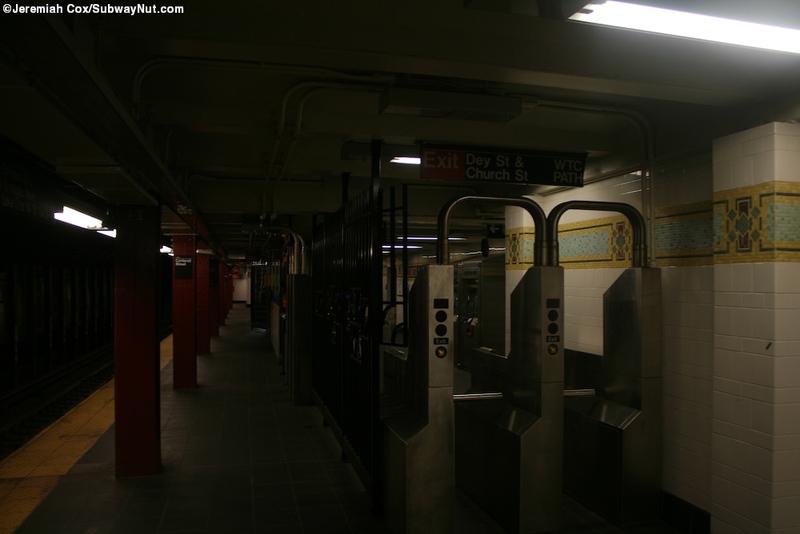 This issue means that in the stations current state all the entrances are on the Uptown platform with the side of Church Street beneath the downtown platform completely closed due to construction. 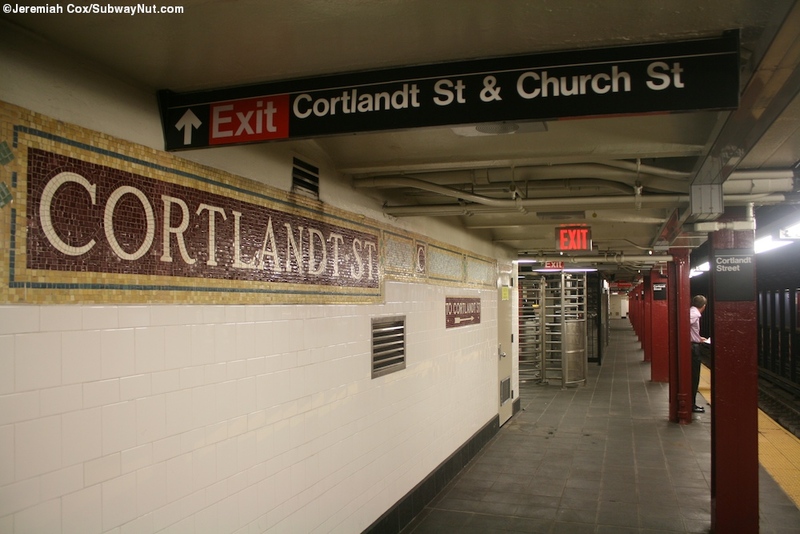 Just before the uptown platforms reopened all of the old signs that used to say WTC were replaced and now say 9/11 MEMORIAL. 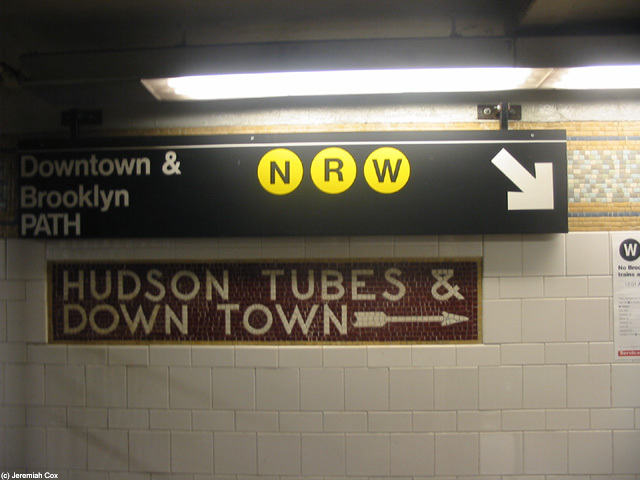 The full time entrance with the token booth is towards the northern end of the station via streetstairs on the NE and SE corners of the intersection with Dey Street and Church Street. 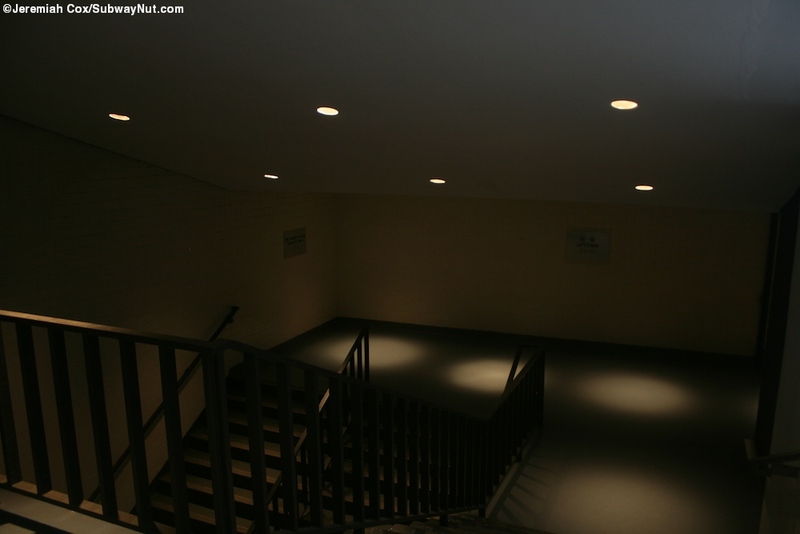 This leads to a very narrow fare control area right on the uptown platform, just beyond it south on the platform is the single staircase down to the relatively narrow open portion (there was an underpass here pre-9/11) of the Dey Street Passagway with a permanent southern wall and temporary northern wall consisting of vertical florescent lights, that will one day make this passageway much lighter, and a single staircase up to the downtown platform. 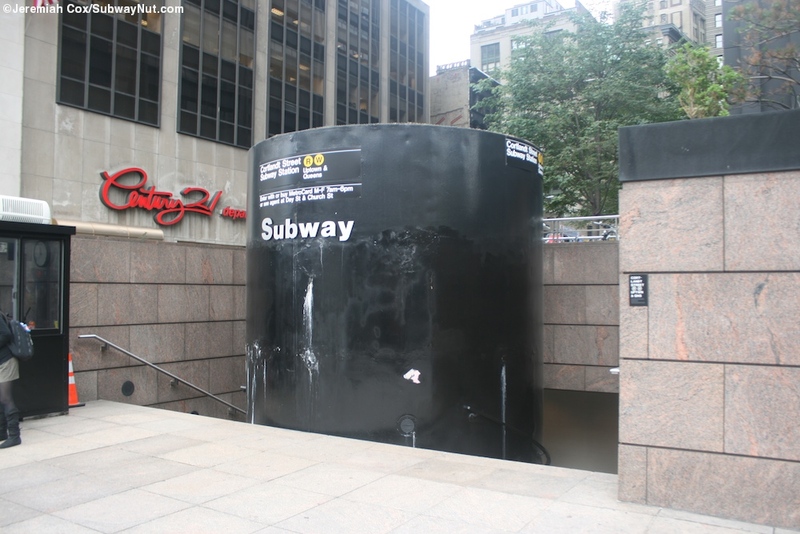 The secondary entrance open from 6am to 7pm Monday through Friday is inside 1 Liberty Plaza at the SE corner of Cortlandt Street and Church St/Trinity Place (claimed by Google to change names at this intersection). 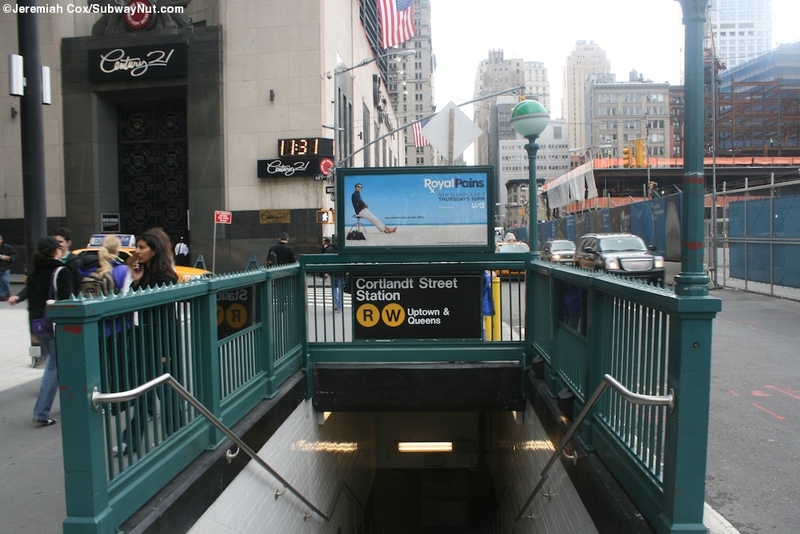 Here two staircases go down at the entrance to an intermediate level where it splits: one short staircase continues down to a narrow high turnstile equipment fare control area and another streetstair to the NE corner on the uptown platform. 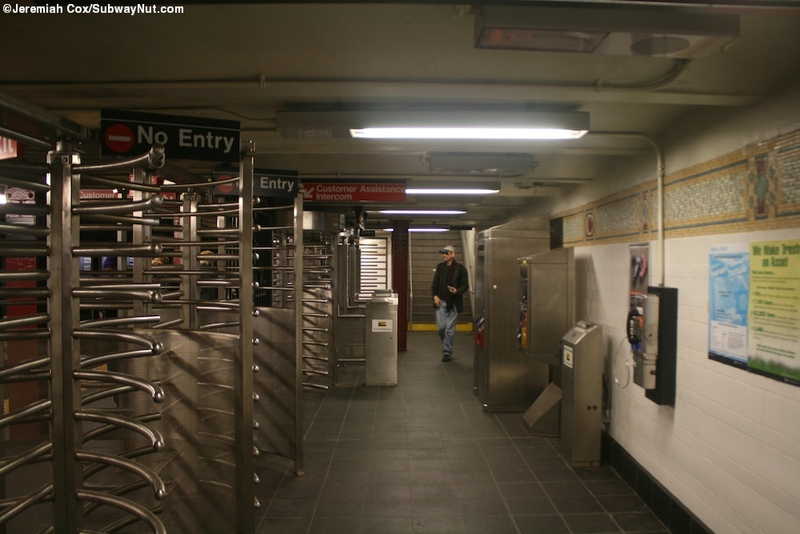 To reach the downtown platform another staircase leads to an up escalator/staircase down to an underpass beneath the tracks to an unstaffed (and no MVMs) bank of turnstiles inside it that lead to a single staircase up the downtown platform. 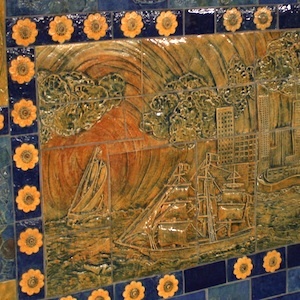 10 October, 2003 (cortlandtr2) Artwork at the uptown end of the underpass, this has no been moved to a different wall.